Disclosure: Thank you Tampico Beverages for sponsoring this conversation. Regardless, all opinions and experiences are my own. Being able to get outside and enjoy the warm weather is our favorite thing to do once it warms up. We love to soak up the sun and have fun with the family. We can always find something new and enjoyable to do outdoors! The girls love to use their sidewalk chalk! We almost always have a hopscotch grid on the sidewalk in the front of our house — and often see neighbors hopping across it on their walks. If it’s not hopscotch, it’s sidewalk art. Everywhere. You will find everything from full body drawings to flowers and city scapes on our drive way. 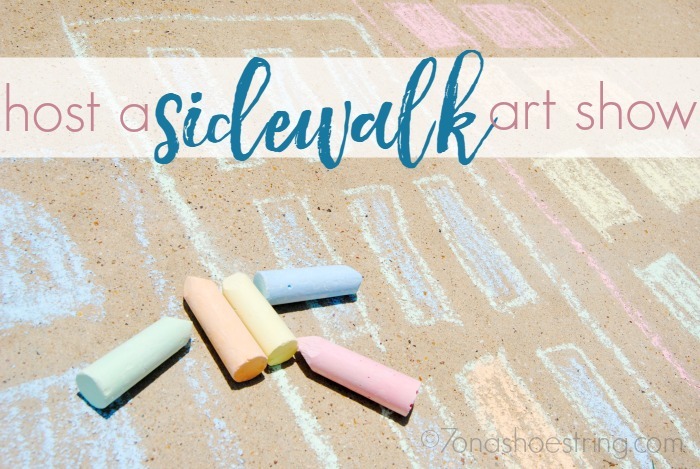 Therefore, this love for chalk inspired another fabulous idea: a Sidewalk Art Show! Check the weather. Spring can bring lots of rain in some areas, so plan ahead and make sure the skies will be clear. Not to mention, when it really warms up the sidewalk can get hot. This leads to the next tip. Be prepared. 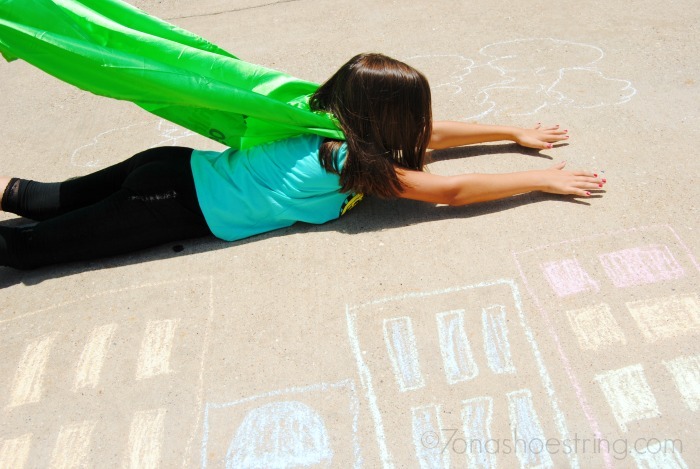 Gather enough sidewalk chalk for everyone to have plenty to create with. 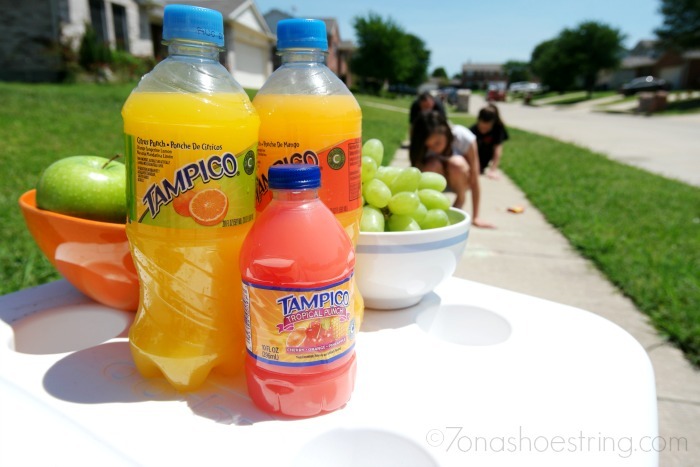 Set out snacks and drinks, such as Tampico. These deliciously blended fruit-flavored juice drinks will keep everyone hydrated and happy during the show. Oh, and the hot sidewalk? Have mats or blankets available in case the sidewalk warms up! Block out canvases. When using sidewalk chalk, the sidewalk is obviously your canvas. Let each guest claim a sidewalk block (or two) for their art work. Perhaps even have name plates for each guest, or encourage them to creatively display their name within their work-space. Get prizes. Decided on categories for winners, such as Most Creative, Best Use of Color, or Most Artistic, and then have a panel of judges or jar for anonymous voting. It’s a great way to motivate and inspire everyone to do their best and really enjoy the show! Have fun! Perhaps the most important part of anything you do with your family, have fun! Yes, there may be a competitive element added to your Sidewalk Art Show, but the main focus should be on the time you spend together with family and friends. Whatever you plan for the upcoming warm months, just make sure to get out and spend quality time with your loved ones. Bring chilled Tampico along for a tasty and refreshing treat no matter where you are!